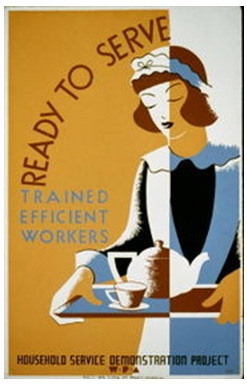 A poster featuring an illustration of a uniformed maid that traditionally described accomplishment of skills. he Estate Manager in America is usually the senior service person in a large household. In England the butler is the most senior staff member, although in the great houses of the past, the household was sometimes divided into departments with the butler (also called estate manager or majordomo) in charge of the dining room (including the wine cellar) and pantry, and sometimes the entire parlor floor, and a housekeeper who was in charge of the whole house and its appearance. In large households there can be several domestic workers doing different jobs. Depending on the size of the staff there might be an Estate Manager-Butler-Major Domo, second Butler/Valet, Houseman, assorted housekeepers under the head Housekeeper's supervision, a Chef or Cook, Chauffeur, Governess or Nanny for the children, and a Personal Assistant. There might also be security staff. Housekeepers are occasionally portrayed in literature as being the most senior staff member and also made recommendations for the hiring of the butler. That position today describes an Executive Housekeeper who acts in the same role as an estate manager. The Estate Manager/Butler also trains the staff as might be necessary and deals with outside contractors, vendors, and party/event planners. Some housekeepers replace the role of a nurse in taking care of the elderly and people with disabilities, and aids or nursing persons are also at times part of the staff. In modern times where the butler is the most senior worker, titles such as Estate Manager, Butler Administrator, Majordomo, House manager, Staff Manager and Head of Household Staff are interchangeable. An Estate Manager (Majordomo) is the head (major) person of a domestic staff (domo), one who acts on behalf of the (often absent) owner of a large residence. Sometimes a personal assistant also works in a large residence environment. Personal Assistants generally take care of the employers with the Estate Manager, or if there is no estate manager they oversee the household staff along with other duties of their job description. The precise duties of the employee will vary to some extent in line with the title given. But perhaps more importantly in line with the requirements of the individual employer. All candidates are required to be legal and have prior professional experience in a private residence.